Along with hundreds of other families we visited Tollymore and Castlewellan Forest Parks on Easter Sunday as part of a stay in nearby Newcastle, Co. Down. The play structures in both forest parks certainly added an extra dimension for our little outdoor enthusiasts, Joshua (7) and Adam (5). Not your typical play parks, made by natural materials they fit in well with the surroundings. 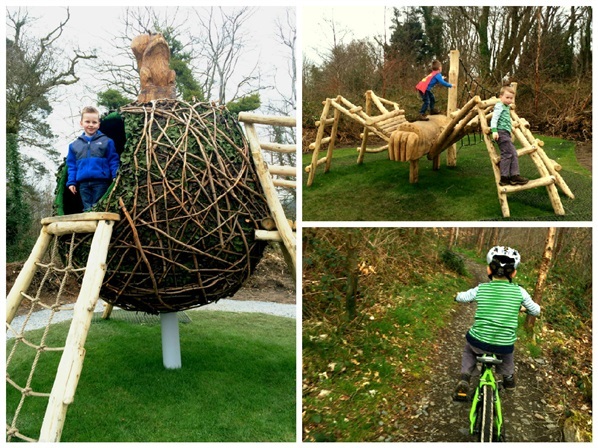 We visited ‘Big Deer’ in Tollymore and the boys were amazed at the size of the structure. After walking through the archway into the park area you see a huge, wooden deer in front of a wooden fairy-tale castle with towers and bridges. My boys, being the seasoned-tree climbers they are, made straight for the highest points finding different ways to climb up each time. 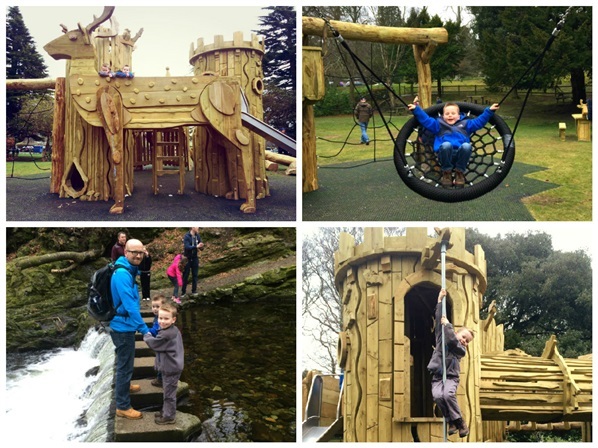 There are bridges, poles, ropes, stairs and climbing walls inside the towers, a slide and swing along with balancing logs - plenty to keep the kiddies occupied during a picnic at the deer-shaped picnic tables or, as we did, after a walk up the river to the Stepping Stones . There are beautiful carvings of animals and plants to decorate the wooden structure and stimulate young imaginations. The play structure is set in a large, enclosed area making it safe and also providing plenty of space to run around. 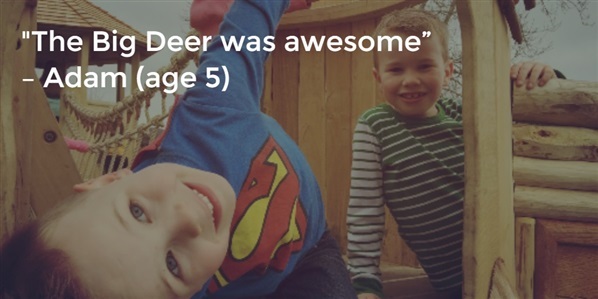 Adam loved the fact that it was all made from wood and thought the big deer was ‘awesome’. Joshua really liked the woodcarvings and the secret door which took him up the tower. After a fun 30 minutes finding our way through the Maze at Castlewellan we found the play area, ‘Animal Wood’ tucked into the woodland above the Maze. 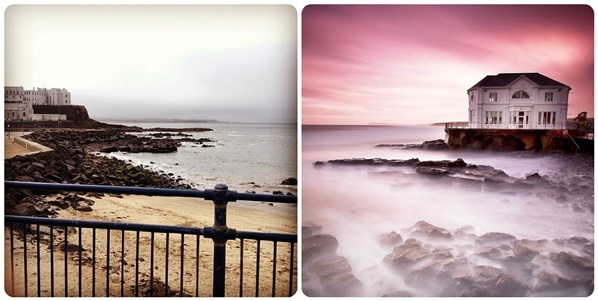 From this area there are stunning views towards the Mourne Mountains and also towards the sea at Newcastle. These structures were based on animal homes and habitats and again the boys had a great time climbing over, under and through various tunnels, bridges, ladders, nets and even a large squirrel drey which was set several feet off the ground. The boys were inquisitive about the names of the animal homes whilst playing on them so this was a great talking point. There was also a fox den with tunnels to crawl through, a spider and web to climb on, and a badger with a set to climb through. There is also a fort structure with stairs and a rope-bridge. Both boys had a super time and even had enough energy left to ride the green mountain bike trail around Castlewellan Lake and race each other on the pump track. Both play structures are well worth a visit and add to the activities already available at both locations. With phrases like ‘epic’, ‘so fun’ and ‘so cool’ being uttered there is no doubt the boys will want to return again soon. For anyone planning to visit, ‘Animal Wood’ in Castlewellan Forest Park is located beside the Peace Maze and the ‘Big Deer’ can be found beside the lower car park in Tollymore Forest Park. Gail is a Primary School teacher and Mum to two active, young boys. She enjoys any activity involving the great outdoors, especially those where the boys can get involved. Gail is a keen runner and cyclist, both road and MTB and likes to push herself to take on new challenges. 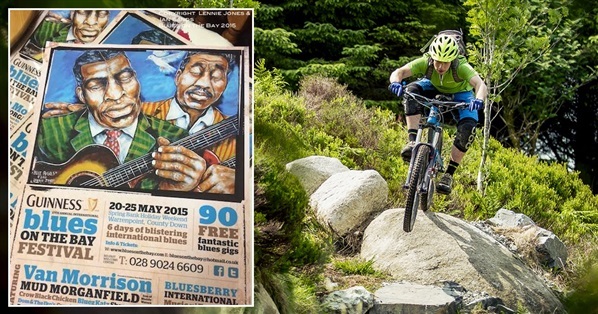 Rostrevor Biking & Blues Weekend! 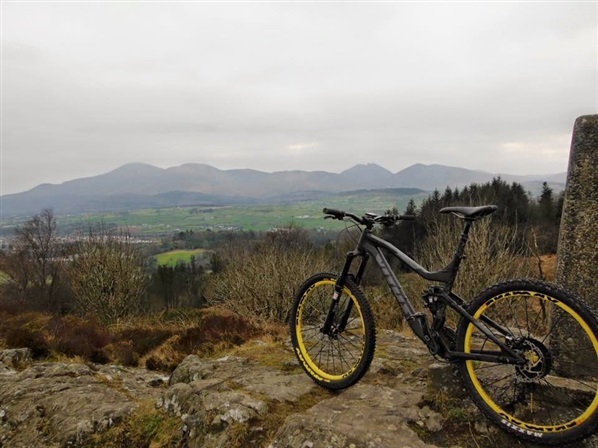 As people from all across the UK and Ireland continue to flock to the Rostrevor Mountain Bike Trails, Carlingford Lough's reputation as an adventure destination continues to grow from strength to strength. However, every May this area is transformed into Ireland's 'Capital of Blues' as it hosts one of the World's most popular Blues festivals, Blues on the Bay. Now in its 17th year, The ‘International Guinness Blues on the Bay Festival’ takes place on 20th - 25th May and this year includes a number of exclusive gigs including an evening with Mud Morganfield (eldest son of legnedary Muddy Waters) and two intimate shows with our very own visionary songwriter, Van Morrison. 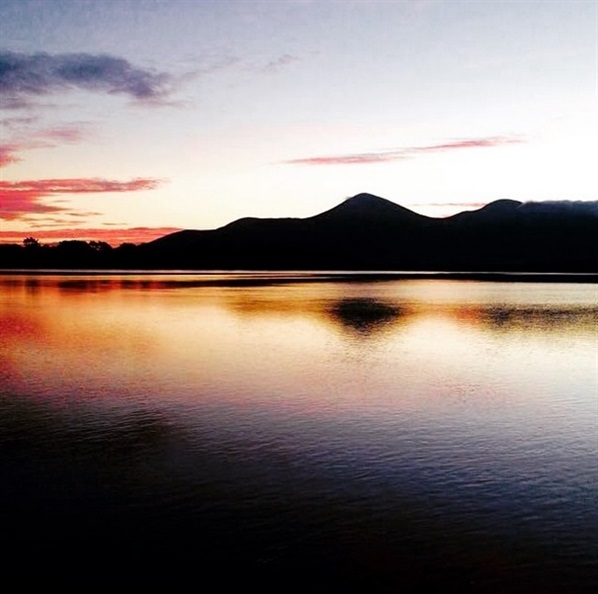 With over 90 free gigs taking place over the course of the festival, there is always an incredible buzz in host town Warrenpoint (2 miles from the Rostrevor Mountain Bike Trails) and so we couldn't recommend a better time to come and enjoy all that the Carlingford Lough area has to offer! 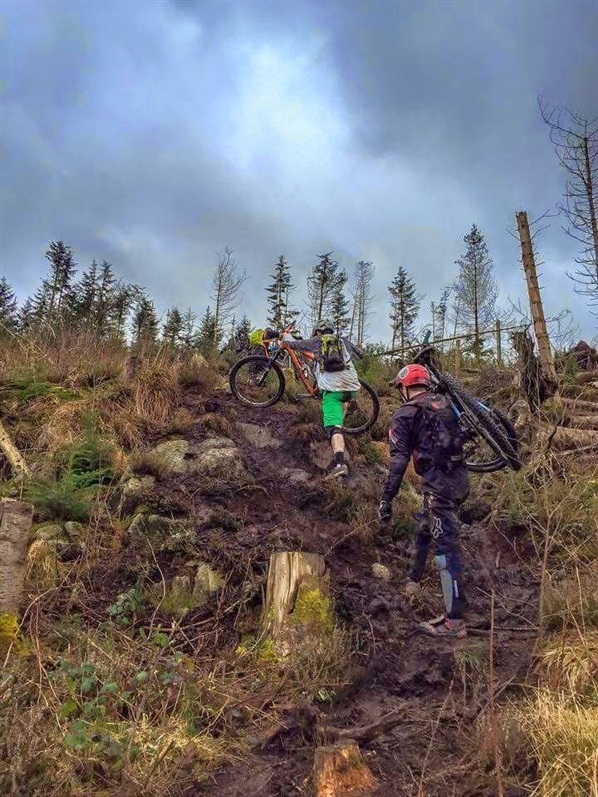 Check out some of our latest MTB-Friendly Accommodation Offers near Warrenpoint and the Rostrevor Mountain Bike Trails for this year's festival! From dramatic cliff top paths to glorious sandy beaches and rolling waves nothing quite beats the feeling of fresh air and spectacular views on a coastal walk. Whether you’re looking for a quick jaunt along the shores of Strangford Lough, fancy a quiet stroll on a sandy beach or want to take in the iconic views of the Causeway Coast Northern Ireland has plenty to offer when it comes to coastal walking. With this in mind we have put together a few of our favourite walking routes for you to enjoy – it’s time to get out and smell the seaweed! There cannot be a more wild and dramatic headland in Northern Ireland than Downhill Estate. With fabulous views that stretch over the whole of the North Coast of Ireland and open windswept cliff top walks, it is not surprising that the estate is part of the Binevenagh Area of Outstanding Natural Beauty and is a well-known icon. Featuring one of the best panoramic views of the iconic Giant’s Causeway and ending at the ruins of Dunseverick Castle, spectacular cliff landscape & rich biodiversity of the coast merge effortlessly with the surrounding farmland to provide what is one of the most spectacular cliff top walks in Ireland. 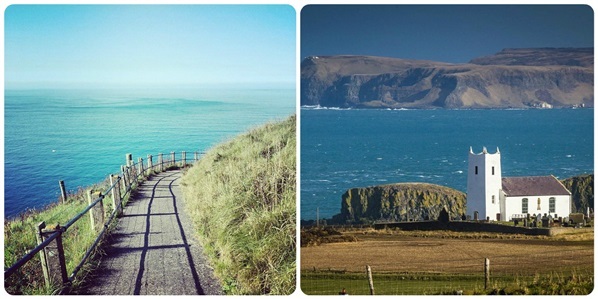 Leave the trail of visitors behind as you pass by attractively named headlands such as Port na Spaniagh, The King & his nobles, Plaiskin Head, Hamiliton’s Seat, Benbane Head, Bengore Head, Portnabrock and Port Moon Bay to experience one of the Causeway Coast’s best kept secrets. Running along a stretch of disused railway line on the western shore of Dundrum Inner Bay this path forms part of the Lecale Way and is great for birdwatching. Beginning in the small National Trust car park just to the north of Dundrum the route can also be easily reached by walking out from the village itself. At high tide it has the feeling of a riverside walk and can be visually quite stunning, particularly on clear sunny days. At low tide the bay becomes a very wide mudflat that is home to various groups of birds and offers a completely different perspective. 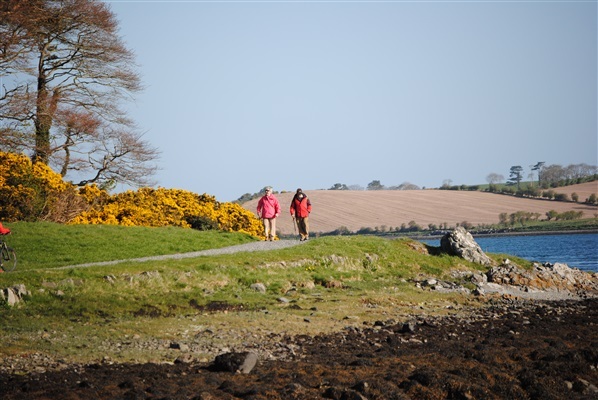 Starting in the Shore Car Park, this wide and flat trail suitable for all abilities follows the shore of Strangford Lough from the farm yard to Audley's Quay and back hugging the stunning shoreline of Strangford Lough. At Audley’s Quay you will find Audley’s castle, dating back to the 15th century and used as a filming location in HBO's epic series Game of Thrones. When it comes to coastal walking it doesn’t get much better than Northern Ireland’s most northernly inhabited island. One of six waymarked routes on the island this walk takes in the south of the island with stunning views of dramatic sea cliffs, sheltered bays and arches along the way. The route also passes Bull Point, near to where Richard Branson crash landed his hot air balloon in 1987, on his record breaking transatlantic flight. This circular route on the stunning Causeway Coast from Portballintrae to the Giant’s Causeway provides the perfect combination of sandy beach and romantic cliff top views. 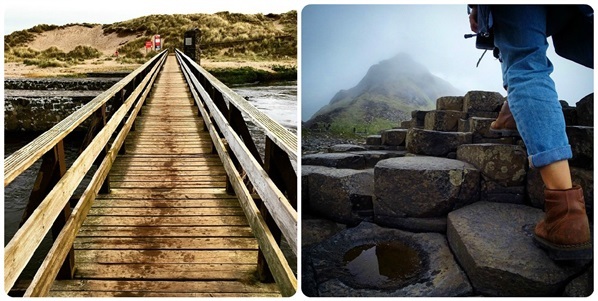 Crossing the picturesque Three Quarter Mile Foot Bridge the route continues through the sand dunes to emerge onto Runkerry Beach and along cliff path to the Giant’s Causeway before climbing uphill for spectacular views over the world heritage site. Beginning at the idyllic village of Cushendall this attractive coastal path hugs the cliffs to the south and offers spectacular views of the Scottish coast, Lurigethan, Red Bay Castle and Garron Plateau. The walk leads to the ruins of Layd Church; a 13th century Franciscan foundation. A church from 1306 to the end of the 18th century the graveyard includes a cross in memory of Doctor James MacDonnell, pioneer in the use of chloroform for surgical operations. Another integral section of the Causeway Coast Way this the gently undulating route, which includes several sets of steps, hugs the scenic stretch of coastline between the seaside towns of Portstewart and Portrush. Passing beaches and promenades the panoramic views of the coastline aren’t the only thing to enjoy on this walk, other points of interest include St. Patrick's Well (thought to be the fresh water supply for the Stone Age inhabitants of the sand hills), numerous Ice houses, Portnahapple, a natural sea pool for outdoor bathing and the Dominican Convent, perched on the cliff's edge. This walk, beginning at Crawfordsburn Country Park located on the southern shores of Belfast Lough, ambles through a hay meadow, full of wild flowers in the summer months before continuing along sandy beaches, including Crawfordsburn Beach and Helen's Bay, passing the wartime fort at Grey Point (a military fort built in 1904), before finishing at Sea Park. 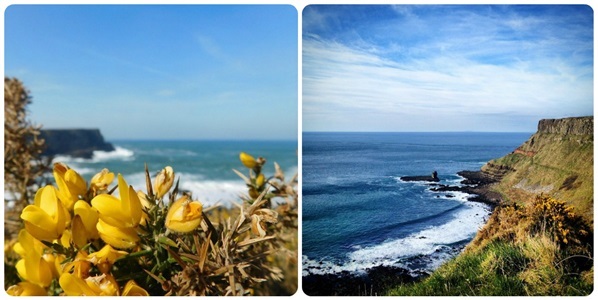 If you can’t get enough of the beautufl coastline you can extend your route along the North Down Coastal Path. 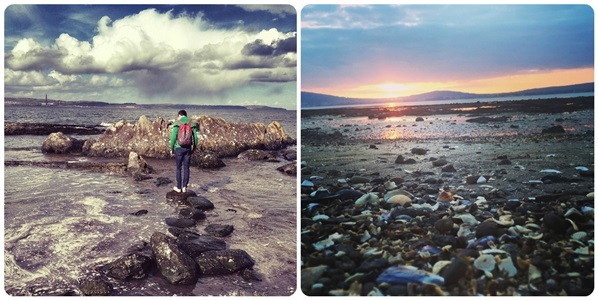 Check out WalkNI for even more coastal and beach walks in Northern Ireland! It's not often we get a three day Bank Holiday weekend so make sure you don't waste it staying inside! With events and experiences ideal for both family and friends seeking adventure there is lots on offer across Northern Ireland during the May Bank holiday weekend. Jump in a wetsuit, pick up a board and head down to the beach for a surf lesson under the mighty Binevenagh Mountain. For those looking to keep the kids entertained while you chill out, sign them up to this years May Bank Holiday Kids Camp where they will be taught to surf in a safe and fun environment. Offering a colourful carnival of exciting activities including archery, body zorbs, and boat rides to name just a few there is a little something for everyone. Pack in more activities and stay onsite in a family Glamping Pod. 3 for 2 entry on activities including, climbing, zip lining, archery, kayaking and more. Glamping available onsite for those looking to extend the fun. Take to the helm and learn to sail on Carlingford Lough taking in awesome views of the Mournes or have a splash canoeing and pier jumping. Take in sights and scenery only accessibly by kayak along the stunning Causeway Coast as you learn the basics of sea kayaking. Dressed as a Member of the Knights Watch and take aim in the very spot where young Bran was taught archery by Jon Snow in Game of Thrones. Extend the adventure with Game of Thrones Glamping in one of the luxury heated Glamping Pods. 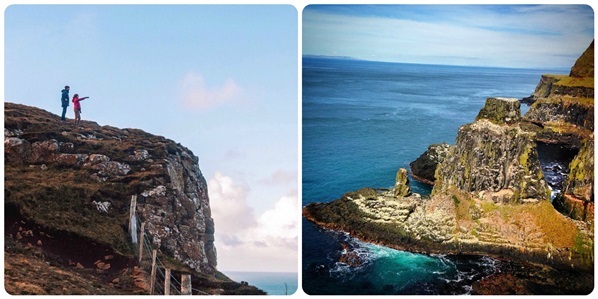 Explore the spectacular Causeway Coast, visiting locations including the Giant's Causeway and Carrick-a-rede Rope Bridge before crossing to Rathlin Island. Explore the less visited areas of the beautiful Lough Foyle and the mouth of the Faughan River in a stable double sea kayak. Looking for the ultimate weekend away? It’s time to get Glamping! Whether you want to roadtrip towards an action packed weekend with your mates or enjoy a family short break in the outdoors with some added comfort Northern Ireland is the place to be. Check out our selection of top glamping sites in Northern Ireland all next to action packed activities so you can have a hassle free adventure in the great outdoors. 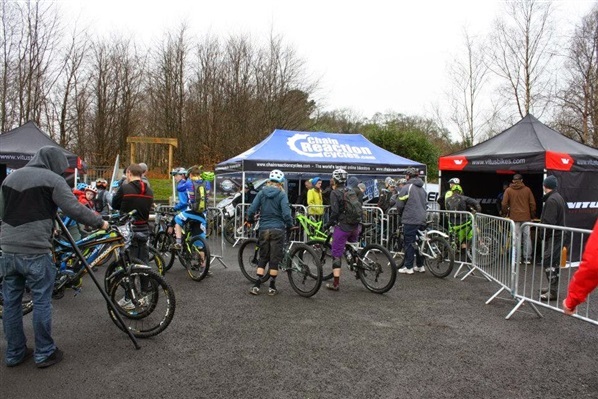 The eagerly awaited Vitus First Tracks Enduro cup kicked off in Castlewellan on the weekend of 28th & 29th March for Round 1. Glyn O'Brien and his team had been working hard on the tracks in the lead up to the event and there was a great buzz of excitement in the build up. The practise session on the Saturday was an informal run out for most. I missed the practise due to work commitments but this may have been a blessing in disguise due to the conditions. 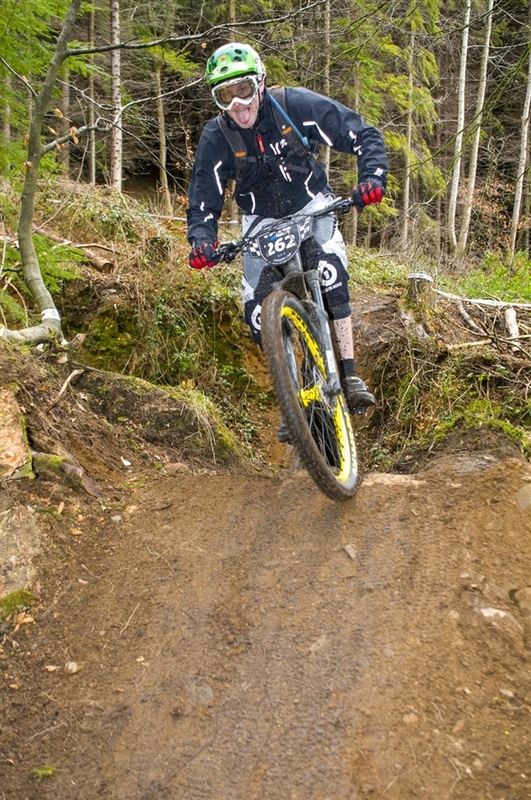 A wet and windy weekend meant the open natural sections got a bit sticky and rutted in places. Sunday race day was overcast and dark rain clouds lingered in the distance. The weather didn't seem to dampen spirits as the race village was buzzing from first opening at around 9. 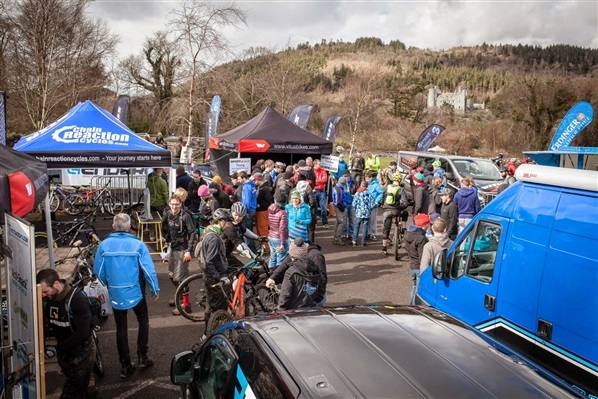 The race village contained event sponsors Vitus bikes and Chainreactioncycles, First Tracks Mountain biking Podium and registration area, Enduro Mountain bike Mag and other various sponsor areas. Registration was well organised and on arrival riders would get a start time, number board and goodie bag. The car park was filled by around 10 and the Pro and Females categories got under way around this time. I had a 10:36 start time along with a few legends from the Klunkers Guild Jimmy, Brendan, Bob and Damien. Chain Reaction Cycles had a scrutineer area and bikes were checked out before moving on to the si-entry tent for timing chips. I am riding the Vitus Sommet Pro model and with the bike through scrutineer we all rolled out onto the trail centre loop around the lake to make our way to stage 1. A leisurely pace so we could save the legs for racing. We passed the end of stage 1 on our way up and got a look at the last bombhole to finish. This was a section I hadn't ridden before but looked fine. Riders had to walk the last section up past the trig point dropping back down to the start of stage one. There was a small queue ahead of us but this was moving fast and give us time to get settled for the start. The talking was over and now it was time for action. This stage started on natural grass and mud trails and finished on trail centre hard packed trail. I rolled up to the start area and the marshal told me the location of the timing box and how the stage was shaping up. I had heard some horror stories from practise due to the muck and wet conditions. I checked the forks, shock and took a deep breath and powered off the start line and into stage 1. The conditions were slippy from the word go and with rocks, roots and other hazards meant this open section was a ride and a half. I dived straight into the steep section and with my Vitus Sommet working well under me tried to get the flow going but keep it fast to pull over the tricky sections. The stage was running well but with multiple line choices it was hard to pick the right line. There was more lines here than at a Pete Doherty after party. I had been doing well until I took the inside line on a corner with a tree. The exposed roots caught me out and getting the leg trapped behind the back wheel and saddle I high sided and shot across to the left. Somehow I managed to hold it without completely coming off and kept moving. Hanging back in behind the saddle for another steep section with hucks and drops I let the bike go and think the faster pace saved me on a few knocks. The Vitus Sommet was made for this type of steep technical riding and was working well. 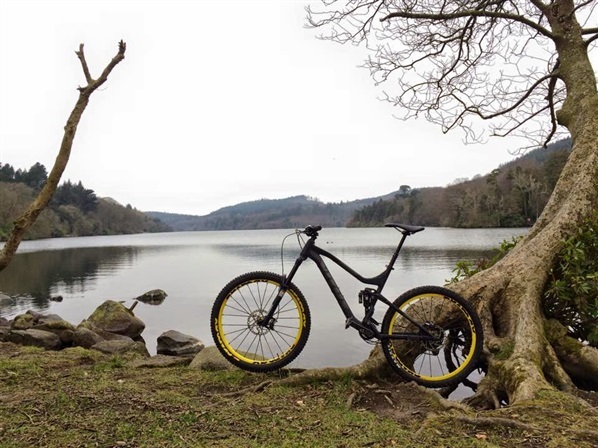 The rockshox Pike RCT3 solo air and Monarch plus RC3 Debonair took the rough terrain with ease. Damping and rebound were set pretty much perfect for this. Just before the crossing into the trail centre section I caught a root and had to dab the foot to keep moving. I was through the worst of stage one and on a familiar section I got the power down and tried to push hard along this hard packed gravel trail centre surface. I spotted another rider ahead and give a clear shout for rider up. The rider pulled to the side and give me a clear run (Cheers for that) The last bombhole section took us off the trail centre and back onto the small drop and jump to the finish. Stage 1 was an action packed stage with a bit of everything, really good to ride. I waited on the others then we climbed back up to start stage 2. 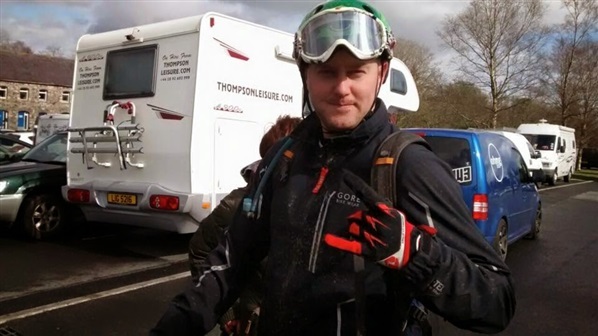 The transitions were good craic and you could hear stories of how stage 1 went for others. Mental was a word I heard on numerous occasions. We got up to the start of stage 2 and again there was a small queue. Just enough time to take a drink and dry out the goggles. This stage started on the trail centre black before dropping into a natural section. Goggles on pedal ready and boom into stage two. The trail centre hard pack gravel was fast flowing and a few small rock gardens at the start were all we had to worry about. This was all about flow and hard pedalling on every section. I was conscious of saving some energy for the natural section which had a few technical off camber and rises to contend with. My 760mm Nukeproof warhead bars are a great feel but with a few tight trees almost caught me out in the middle section. I pushed hard along the trail and when I seen the tape indicating the turn into the natural trail got myself set up for the drop down into a rooty washed out corner. I dropped down into the corner and with only a bit of rear wheel drift pulled it through the corner. I got on the pedals and hammered across the walking path onto a grassy section that was caked in muck. I tried to keep traction and pedalled up over a wee rise. As I pushed through a tricky uphill bit I clipped a pedal and got sent off the trail. I scrambled back onto the bike trying to save any lost time. Into another off camber section there was a top, middle or bottom line. Unlike Michael Barrymore I decided against the bottom and went high into a tight hairpin. As I railed into the corner the bike just went were I wanted it to go. Another tight hairpin left and one last push across the finish. The familiar face of Keith Williams marshaling set us off into one of my favourite sections. The top section of this trail was all natural but with tree cover had held up well despite the rain. I set myself up and tore off into the tree lined trail. Sweeping corners with bermed kickers, rocky drops and a soft pine covered surface. Hammering into a tight hairpin and hopping the ruts I kept the power down as the bike seemed to grip well on the forest floor. The steep drop into an open section had caught me out in the past. I took a tighter line staying out of a rut and this kept me steaming across the open for a jump and hard right back into the trees. Another lovely tight section with a double drop and a rockgarden huck finished through a series of sweeping corners. Half way through and now we joined the trail centre. This started with a hard pedal then into a rock garden. I got the power down and kept it flat into the next rock garden with a pre jump I sent it into the first section. The bike skipped around below me and no sign of the end of the rock garden I thought I over cooked it. There was no good line and if I am honest I was on auto-pilot. I was just glad it skipped through without getting caught up. What seemed like an age the small bermed corner at the end was a relief railing me into the smooth trail. The trail ramped up and this really worked the legs. My heart rate went through the roof but with the end in sight I pushed on across the line. A much needed rest and time to fuel up at the feed station. While waiting on the others I took on some water and Bananas. Damien arrived at the end with another puncture. When your lucks out it really is out. This was his second or third of the day. We waited around till he got sorted and started the climb up to stage 4. Stage 4 and 5 started in an area that resembled a forest hit by a hurricane. Fallen trees zig zagged the path and the only way in was up a steep rocky incline. This bit got us warmed up after a long stop at the end of stage 3. Steve Bell give us the heads up about the start. He showed us a good starting point avoiding a rut that had caught out a few riders even before the start beacon. I give the rider in front a hefty start and then dropped into the technical start. Smooth corners giveway to rocky ruts and washed out berms. Two fast sweeping corners and already I seen the rider in front. I give a quick call and he stayed left I got down the inside. This was just in time for a steep rock drop and into a fast technical off camber corner. Roots on the inside and a two wheel drift got the pulse racing but thankfully the ramp of mud on the corner held my wheels and kept me in the trail. Another fast flowy section before crossing the walking paths and the infamous Moorish Tower (Paul Cromie your secrets safe with me) It was great to have marshal Dermot Devine shouting words of encouragement just in time for a wee rise in the trail. A much needed gee up at the right time and I drove the pedals hard before turning left into a steep rough section. Fast as I could push it through this section. The bike was gripping when I wanted and turning when I wanted, it was the confidence I needed to give it some more. This bike just wants to be pushed hard on the steep stuff. A tight left hander before dropping onto the fireroad past the feed station and linking onto the lower section of trail centre for a hard push to the finish. The legs really felt the burn at the end of that stage and with only two more left I hoped I had something left in the tank. We got moving and headed back up the hill to the hike a bike section. Again a tight wee pull with the bike on the shoulder really stretched the legs. This was another quality stage starting in technical natural trails. Later finishing with a lung busting pull up the moorish return. I had a technical line sussed in a previous weeks practice. A steep drop with a tree stump half way down and a tree on the right. I knew it cut a big chunk of time on the strava segment and having done it any time I rode it before that was the line I wanted to ride. I started ok and was just getting into the flow when I nearly binned it on a deep rut. It unsettled me a bit but I got on the power again getting ready to set up for the drop. Looking up ahead I noticed the steeper line was taped off. I tipped it around the corner and pedalled on trying to put it out of my head. I hadnt rode this wee bit but pushed on regardless before rejoining the exit point I was used too. The line seemed to set me up wrong for a tight tree lined rocky section and getting crossed up lost all flow. I pushed on through another new section that took us to the moorish return. I knew the pain was about to begin with a long pull up a rise in the trial centre. Slacking means lost time and as heavy as the legs felt I tried to drive it on. I heard the familiar voice of the bashed up Wayne Davidson encouraging us to push hard for the finish. I felt like I had a strong finish to that stage and with only one to go the adrenaline was pumping. Another small delay for the unluckiest Klunker of the day Damien with yet another puncture. The wait give me time to get chatting to the boys of Carn wheelers and East tyrone Cycling club. We all got moving again and joined the final queue of the day. This was a trail centre flat section to the finish. I got on the pedals and pushed as hard as I could to get moving. The legs were screaming at this stage but I knew the end was near. I tried to make it flow rather than stay on the gas the whole way. As the trail started to descend towards the pump track I got a chance to free wheel and pump the bermed corners keeping the pace up. A rocky end to the trail which had caught me out before had me braking to avoid getting caught up. A quick dip of the bars to take me around the rocks and into the pumptrack. I pushed it into the pump track doubling the first section and then sweeping through the rest as I started to slow I just got on the pedals to take me over the last big whips. It was great to hear the final beep at the end of stage 6. We handed back our number boards and rode across to the race village for our times. With the timing system in full flow and riders still on the course I knew the time didnt mean much until it was over. I seen 9th in class and 53rd overall. I was delighted but expected this to fall with a fair few riders left out on course. There was smiles all round and the area was really buzzing. After a shower and a coffee we headed back up to check out the times and see the prize giving. With all riders in I had finished 11th in my Class (Masters B)and 63rd overall. I was shocked with the time and really delighted to have been able to keep it steady through the day. I had the odd mistake here and there and a few hold ups but think I know where I can improve. The event went well and the trails held up despite the rain. Really enjoyable event and looking forward to the next one. Glyn O'Brien and his team have done a smashing job. Round 1 in the bag and more of the same to come. Bring it on!!!!! !